Artist in Residence @ L'Artishe: Fourth Sale And The Sun Is OUT!! I achieved my target yesterday and I guessing that nobody worked out what it was. I managed to not mention the weather. I have noticed that I do tend to go on about it a lot but I guess that is because my business is so weather reliant. Another sale today which is always nice for a Saturday or any day to be honest. That takes it up to 4 sales, I am very pleased with that as I think Josh really deserves the success. I have had more of the work for the next show delivered today. It really is going to be knock out. In a completely different way to Josh. 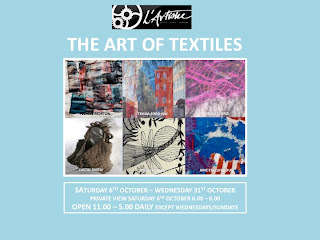 There are just two more days left of this show and the Textiles show starts next week on Saturday. I am hoping that as the Textiles exhibition is on for three weeks I will have time to do some of my own work. I have to start to get it framed asap as there is so much of it. I hope that you are able to make the most of the weather this weekend!